On Thursday, September 6, 2018, Yanawana Herbolarios presented the first community meeting of Sowing la Futura at San Anto Cultural Arts in westside San Antonio, TX. 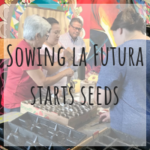 Led by Gordon Schultz, Permaculture Director for Yanawana Herbolarios, residents of Avenida Guadalupe congregated in San Anto’s community space for an introduction into permaculture. Gordon described the principals of permaculture, common patterns, benefits, and how we will be applying permaculture to the community garden project at San Anto this fall. After a brief break for PB Energy balls, we worked together to do some eco-planting – utilizing toilet paper rolls, fruit crates and compost to start seeds for the planned garden beds. Heidi Sobotik led the group on how to set up each seed starter, plant seed, and care for seedlings over the next few weeks. Overall, the group planted three trays of lettuce, carrots, radish, pumpkins, grapes, passionflower vines, spinach, culinary herbs, and native medicinal seeds (and more!) that will nourish the community through the winter. The students from San Anto’s afterschool program will care for the seedlings for the next two weeks, then after the wicking beds are complete, we will plant them in the garden. Many thanks to San Anto Cultural Arts for partnering with us on this great project!